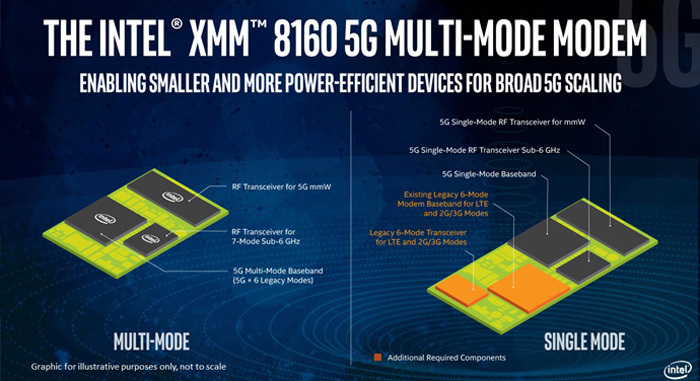 Intel has announced its XMM 8160 5G multimode modem. It proudly states that it has been able to launch of this modem more than six months early. However, it won’t be available until 2H19, and then device makers won’t be rolling out phones, PCs and broadband access gateways packing this chip until 1H20. This single chip solution is attractive to device makers who can pack in a broad range of connectivity fall-back options for when 5G, or even 4G isn’t available. 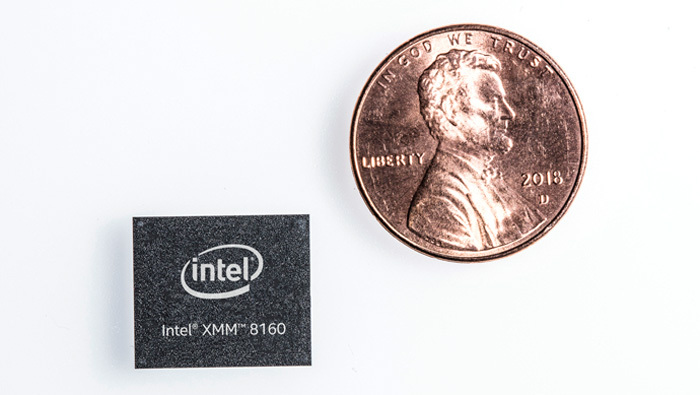 Meanwhile the chip is said to be small and power efficient, especially compared to competitor offerings with separate 5G and legacy connectivity. Intel provides some technical details of the XMM 8160 5G. It says it offers simultaneous connectivity (EN-DC) for LTE and 5G. The modem’s technology can support new millimetre wave (mmWave) spectrum as well as sub 6GHz 5G NR support (including FDD and TDD bands from 600MHz to 6GHz) and download speeds up to 6Gbps. Intel reminds us that the move to mmWave and mid-band spectrum “addresses the enormous need for more bandwidth for users, devices and connected machines”. In the UK we might see some mobile network companies market fibre broadband alternatives. As mentioned in the intro, the first devices packing the Intel XMM 8160 5G are expected to become available in 1H20. Rival Qualcomm will have its X50 5G modem in smartphones during 1H19 – it offers peak 5Gbps download speeds and pairs with Snapdragon mobile processors (which provide legacy connectivity fallback). If this is true, then we have at-least one thing that intel offers, which seem somewhat consumer friendly. According to Charlie, it isn't true. I'm starting to wonder if Intel are just losing it completely between the fake modems, missing 10nm and cobbled together CPUs. “Launches” is a very strong word for something that they cannot even show off real silicon for, presumably made on a process that Intel has major issues with, especially when you are making tens of millions of chips for iPhones. Also indicates the cancellation of 8060, which indicates major design issues for that not to be worth continuing with. how much choice do phone manufacturers have if they go with a snapdragon soc, is the radio part of that or can they mix and mat h with a SD processor and Intel radio?